This post is going to have a lot of complaining in it. There isn’t any other way to say it. I haven’t written much because I feel as though all I have as of late are a series of complaints, but then again this blog wasn’t designed to share just the pretty in my life. It’s for the ugly as well. Our trip to Dallas was a whirlwind, and we had a great time. But we were tired. The kids were tired. Gabe and I were tired. We needed a vacation after our vacation. But life resumes as usual and just as I was starting to feel like I was catching up and things were going back to normal, the plague hit. Eddie came down with it first. Then Sam, and yesterday Gabe and Caleb finally caught the bug. So far, I am the only heathy one in the house. It starts with a runny nose and fever and seems to progress into a cough and to put it delicately…stomach issues. This is also the week where I am trying to prepare the house for my absence. I am attending my sister’s wedding shower six hours away in Western Washington and I will be gone all weekend. This is the first time I’ve ever been away from my husband and kids…ever. So naturally, there is a lot of prep work to be done: cleaning, laundry, meal preparation, etc.. In other words, this was not the time to be dealing with three sick children. And to top it off, God only knows why, but I agreed to host the preschool co-op here on Friday, which has doubled in size. I’m tired. I’m overwhelmed. I just want to sleep. Our neighbor dropped off ten pounds of pears on our back porch yesterday. She didn’t want them and said they would just rot at the base of the tree unless we took them. Despite knowing that I wouldn’t have time to do anything with them, I couldn’t bear to let them go to waste. This evening I started to peel the pears and wash the jars, because even though I knew I couldn’t possibly fit anything more on my plate right now, I decided I was going to spend the remainder of my night canning. Gabe walked into the kitchen and found me peeling pears, near tears with a sick, wailing two year old at my feet. “Just stop,” he said. “If we’ve allowed thousands of pounds of apples to rot on our property we can afford to let someone else’s pears go to waste. You don’t have time for this. You don’t need to do this.” He was right. I need to let go. I can’t do it all. Now they sit on our back porch in the rain. Gabe will take some to work with him. The kids will eat some, and I will make some pear sauce for the co-op on Friday, Whatever we don’t eat will be thrown in the compost. I should be okay with it, but I’m not. Then again, I don’t have any other choice. My knitting hasn’t progressed much. I have been designing a sock pattern in my head but the farthest I’ve gone is making some notes on a piece of paper and knitting half a swatch. 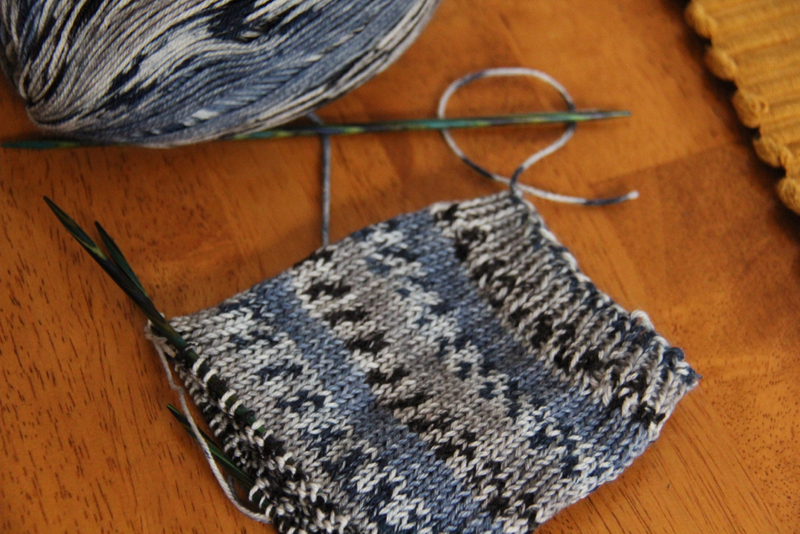 I’m still working on a pair of self striping socks for Gabe, and the ease of it is oddly comforting right now. Mindless. It’s what I need. Thank you, Mari-Liis. I must say, your supportive words were very uplifting! You poor thing. I’m echoing your hubby….”You can not do it all”. We love our family so much that we want everything to be perfect and abundant and we want to show our love by doing things for them and creating the perfect home. Slow down sweety and find a way to get some real rest. Dare I say…even if that means asking for some help from a friend or loved one. You will be amazed at how much clearer things will be. You need a weekend away with your sister. Enjoy it. I’m praying for rest, a peaceful heart and mind and calm for you and your home. I’m also praying for safe travel. PS. You all ready have a perfect home…..because it’s filled with Love. We can all see it in your blog. Krissy, Our home IS filled with love and you stating that you can see that through my blog meant so much to me and really put my stress in perspective. Thank you!